Paul McBeth with the Chili's Guy between rounds. Paul looks hungry. My first reaction is to laugh about it- simply because Paul plays disc golf at a level that 99% of people can’t. Yet, it looks like he’s getting his super powers from a simple restaurant chain located in every major city of the US. We got in touch with him and inquired about the connection, and he offered up a little clarification. Apparently, while it may be a pattern, it was more due to having a friend in the Arizona area who managed a Chili’s Restaurant. How could anyone resist a free meal while on the road? However, truth be told, Paul had also hit up the Chili’s in the Clearwater area before November’s Moccasin Lake Open (we have inside “Nasty” sources)- and wouldn’t you know it? He beat out the Champ, Ken Climo, on his home course, for the victory. 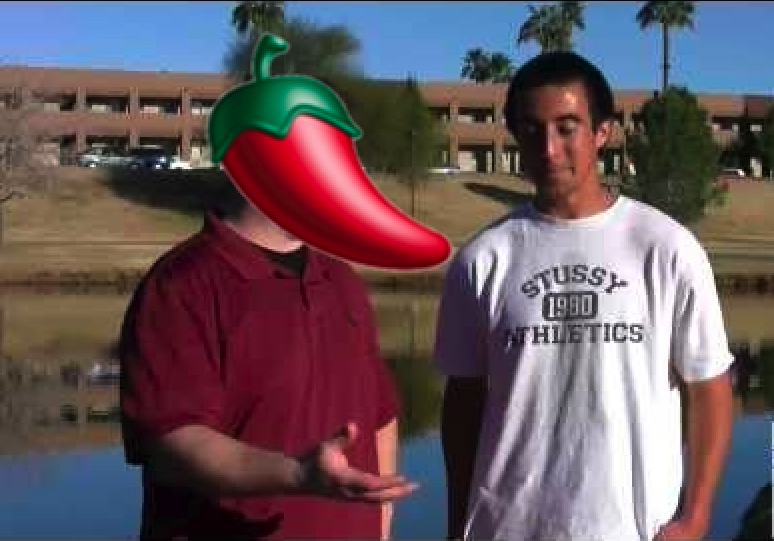 So Paul might want to play it cool and say his visits were random, but I’m thinking Chili’s needs to throw Paul McBeth an “All You Can Eat for a year” coupon and hook up a loyal customer! That’s a perfect sponsor! They’re obviously a match made in heaven. Back to reality however, he did reveal some specific pre-round routines that he enjoys, “Something I like to do is push ups in the morning. I feel it prevents noodle arms for that day’s worth of play…” But even before the morning of a tournament, he keeps the preparation of his body at the forefront. He told us, “Something I really enjoy doing tournament nights is… a movie or mini golf. Both are fun and relaxing and allow you to sleep and wake up without soreness the following day.” Instead of spending any extra time cramming in drives or putting practice, he relaxes- something that can only be done successfully by a person who is already prepared. Could we all shave some strokes off our own tournament rounds by eating at Chili’s and playing mini-golf? Probably not. Personally, I think the key to a good round is listening to Eminem’s song “Lose Yourself” immediately before. After all, we only got one shot, and opportunity comes once in a lifetime. Ok, that might not work perfectly either. The key is being ready. You can’t be ready without putting in the practice and hard work, but you also can’t play your best if you’re tired. Paul McBeth has come to a point in his game, and his travel (touring all over the country), where just finding a little regularity and routine gets him prepared and ready to play his best. This entry was posted in Opinions & Technique, Touring Pros and tagged disc, golf, mcbeth, paul, prepare, ready, ritual, tournament. Bookmark the permalink.